mechanic with just common hand tools. For machine construction, electricity can be replaced with “elbow grease” and the necessary material can come from discarded vehicle parts. What can the MultiMachine be used for in developing countries? Building and repairing irrigation pumps and farm implements. Making and repairing water pumps and water-well drilling rigs. Building steel-rolling-and-bending machines for making fuel efficient cook stoves and other cooking equipment. Anything from making cart axles to rebuilding vehicle clutch, brake, and other parts. Building simple pipe-and-bar-bending machines to make school furniture, providing “hands on” training on student-built MultiMachines that they take with them when they leave school. A group of specialized but easily built MultiMachines can be combined to form a small, very low cost, metal working factory which could also serve as a trade school. Students could be taught a single skill on a specialized machine and be paid as a worker while learning other skills that they could take elsewhere. How can an easily built machine tool that is made from junk be “all purpose” and also accurate? Pretty simple! In almost every kind of machining operation, either the work piece or the cutting tool turns. If enough flexibility is built into the parts of a machine tool involved in these functions, the resulting machine can do almost every kind of machining operation that will physically fit on it. You may have heard of 3-in-1 machine tools — basically a combination of metal lathe, mill and drill press. The MultiMachine starts there but adds many other functions. It can be a 10- in-1 (or even more!) 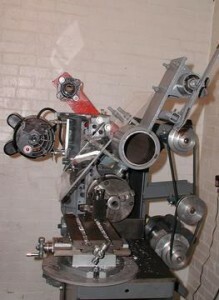 machine tool that is built by using vehicle engine blocks in a LEGO-like fashion. The MultiMachine uses 6 unusual construction techniques to build 5 very simple “modules” that bolt to a worn out or broken vehicle or industrial engine block. Using engine blocks as building blocks is the first MultiMachine feature. Since cylinder bores are bored exactly parallel to each other and at exact right angles to the cylinder head surface, MultiMachine accuracy begins at the factory where the engine block was built. The second MultiMachine feature is that in the most common version of the MultiMachine, one that has a roller bearing spindle, this precision is maintained during construction with simple cylinder re-boring of the #3 cylinder to the size of the roller bearing outside diameter (OD) and re-boring the #1 cylinder to fit the overarm OD. The best part is that these cylinder-boring operations can be done in almost any engine shop and at low cost. An engine machine shop provides the most inexpensive and accurate machine work commonly done anywhere and guarantees that the spindle and overarm will be perfectly aligned and at an exact right angle to the face (head surface) of the main engine block that serves as the base of the machine. The third MultiMachine feature is that the spindle can be as simple as a piece of pipe made to fit the inner diameter of the bearings. The fourth feature is the addition of a third bearing to the spindle. The three-bearing spindle is necessary because the “main” spindle bearings just “float” in the cylinder bore so that the third bearing is needed to “locate” the spindle, act as a thrust bearing, and support the heavy pulley. The fifth MultiMachine feature is our unique way of clamping the engine blocks together. It’s easily built, easily adjusted, and very accurate. The sixth feature is a concrete and steel construction technique that we resurrected. It was heavily used in industry during the first world war. You can also browse the book as html at this link.